Choosing Upholstery Fabric? Read This First! One of the main reasons people choose to reupholster old furniture is because the original fabric has worn out. The colour may have faded, or the material might have been used so frequently that holes are starting to appear. When you’re deciding on a brand new material, it’s vital to choose one that will last. Talk to your furniture repairer about how your furniture is likely to be used and take their advice on fabrics that are durable, colourfast or wipe clean as necessary. This is even more pressing for those who want to get outdoor furniture upholstered. When your furniture is vulnerable to the elements – rain, heat and storms – you want to be sure you’re getting a high quality and long lasting material to protect it. At Lounge Repair Guys, we source our quality fabrics from a diverse range of suppliers. As such, we have a huge choice of fabrics that will go the distance with your furniture, including leather and vinyl. We also have a variety of outdoor fabrics built to stand up to harsh Australian conditions. Did you know that outdoor fabrics aren’t just limited to your backyard anymore? In fact, due to their modern look and durability, it’s becoming more and more popular to use outdoor fabric to upholster your indoor furniture. Try beach chic stripes to put a fresh face on a sitting room or tough polyester material to spill-proof your favourite TV chairs. Remember, a quality fabric will extend the overall lifespan of your furniture, so be sure to choose a long lasting fabric from an upholstery specialist you can rely on. Great furniture is practical, but also ‘says something’ about who you are and how you want to present your home to family and friends. If you’ve just moved house or redecorated your current home, you may find that your old furniture doesn’t suit the new space. Reupholstering furniture gives you the chance to hand-pick fabric ideal for your new environment. It costs less than buying new furniture; you’re also not limited to the current showroom selection! There are so many fabrics to choose from when it comes to giving your furniture a facelift – and each brings its own style benefits. Cottons and denims are ideal for casual living spaces, whilst leather and vinyl may work best in a formal dining room or home office. You’ll also find a wider array of colours in some fabrics than others. Looking for bold, block colours? Choose leather. Keen on florals, stripes or abstract patterns? Look for printed cottons, bamboo or polyester. It’s easy to get the look you want for your new rooms, even on a budget. Faux leather and microfibre fabric options are often a great cost-saving option. Outdoor fabrics may also be cheaper than delicate fabrics. Be sure to ask your upholsterer for all the options! What is being upholstered – and how will it be used? Think about how the furniture you choose to reupholster will be used, and where it will be positioned in your home, before selecting a fabric. If you’re reupholstering a well-used piece of furniture, be sure to choose a resilient material like vinyl or polycotton. If your furniture item is purely for show, consider luxury materials such as silk or satin. It’s also important to consider furniture fading. If your furniture item will spend its time under a sunny window, avoid dark colours that may be impacted by bright light. Dining chairs are another item that often operate in ‘tough conditions’! Be sure your choice of fabric will handle occasional spills, as well as the inevitable cleaning process. Perhaps you have an unusual piece of furniture that needs upholstery repairs? At Lounge Repair Guys, we’ve reupholstered seating in boats, caravans and theatres. In these cases, you’ll need to identify hard-wearing, waterproof fabrics that stand up to frequent use. Furniture repairs are also not limited to furniture! You can reupholster cushions, bolsters, ottomans and some drapery to match perfectly with your design plans for any home, office or business environment. Is it just the fabric that needs work? Whilst you’re choosing new fabric for your furniture, it’s also important to consider any other work that the furniture item may need. As furniture gets older, the wear and tear goes deeper than just fading fabric. Busted springs, torn foam, broken frames and ruined recliner mechanisms are just a few of the challenges you might face when renovating vintage furniture. If additional repairs are required before re-covering, this may also impact your choice of fabric. Consider whether your furniture item will look different after repair, or whether you may need to alter your intended use for the item. Talk to your chosen upholsterer for advice about the structural integrity of your furniture before re-covering. Who will do the reupholstering? offer assistance with transferring your furniture to their workshop, if required. Always choose a business that prides itself on professionalism and superior workmanship. At Lounge Repair Guys we offer a 12 month warranty on every repair. 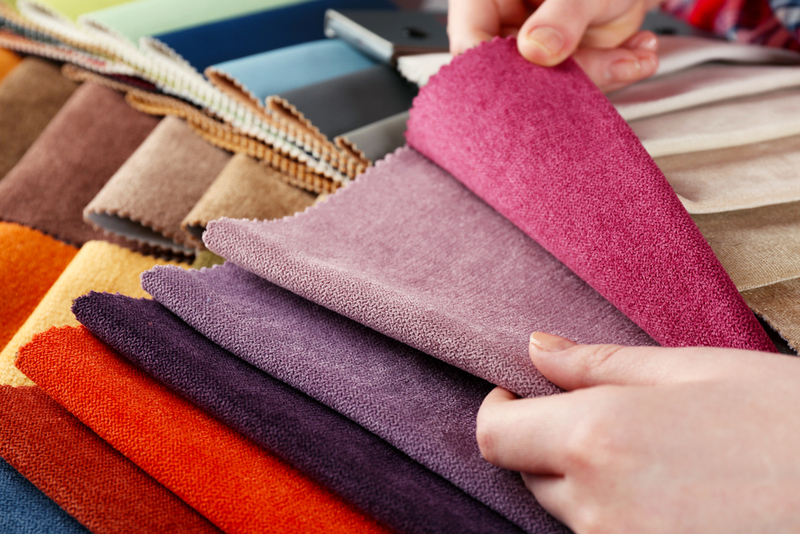 When it comes to choosing upholstery fabric, our trained technician will provide you with samples as part of a no obligation quote. Alternatively, you can visit our workshop or our suppliers’ showrooms to inspect the range. Choosing upholstery fabric is an important process. If you want your furniture to look good and last a long time, be sure to select a high quality fabric and choose expert upholsterers to do the job. Need advice on choosing the right upholstery fabric? Talk to the team at Lounge Repair Guys today!